Our planet is full of wondrous species. Amazing creatures that the mere sight of seems to awaken something in our collective imaginations. 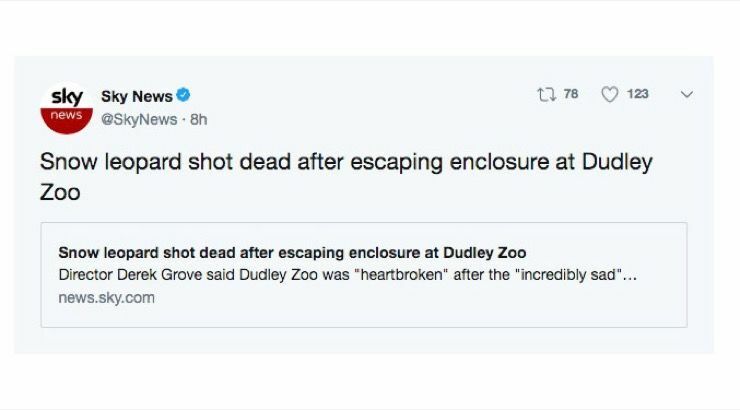 Unfortunately, some human beings want nothing more than to own the normally unobtainable treasures that these animals represent, and they’ll do anything to get a piece. It is because of human greed that so many of these amazing creatures are sitting on the endangered species list. Whether hunted to the brink of extinction due to their hides or horns or driven from their homes by the mere presence of humanity, the loss of any single one of the creatures on this list is a tragedy, especially when the death is caused by human hands. 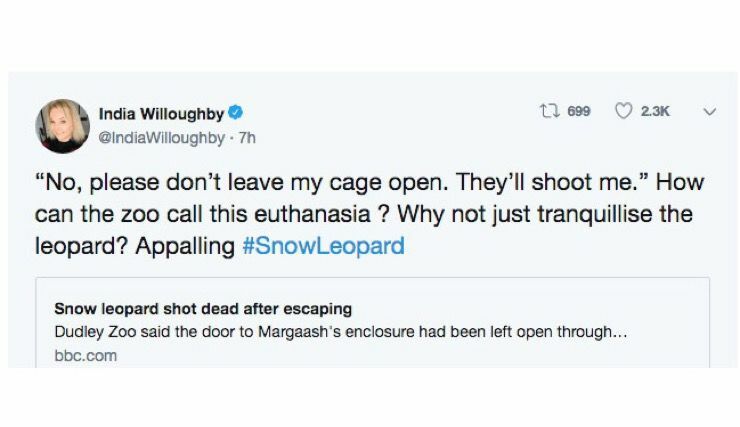 Eight-year-old snow leopard Margaash was perhaps the Dudley Zoo’s most prized specimen. 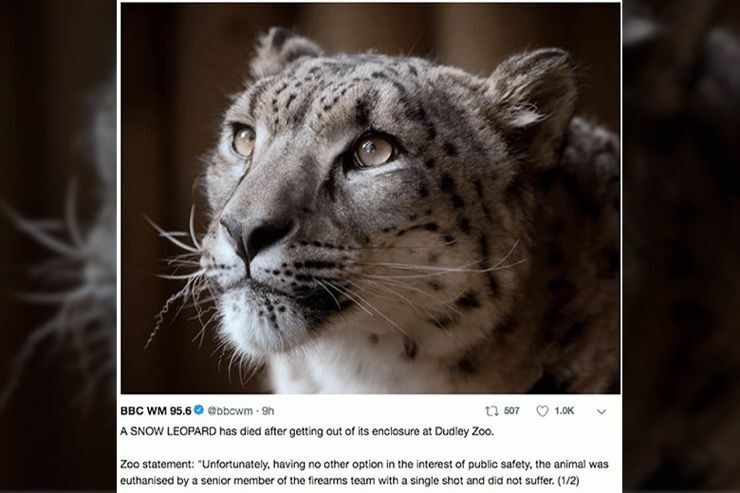 Not simply because she was a stunningly beautiful example of her species, but also because her life represented hope for the snow leopards, both in zoos and in her wild home in the alpine zones of eastern Afghanistan, Mongolia, and western China. It was late in the evening when one of the keepers at Dudley noticed the door to Margaash’s enclosure had been left slightly open. Peering inside, the keeper realized with a start that the snow leopard was nowhere to be seen. While Margaash was among the larger big cats out there, she was still big enough to take down a human being, especially a child, if the situation presented itself. The keepers mobilized and began to look for Margaash right away. 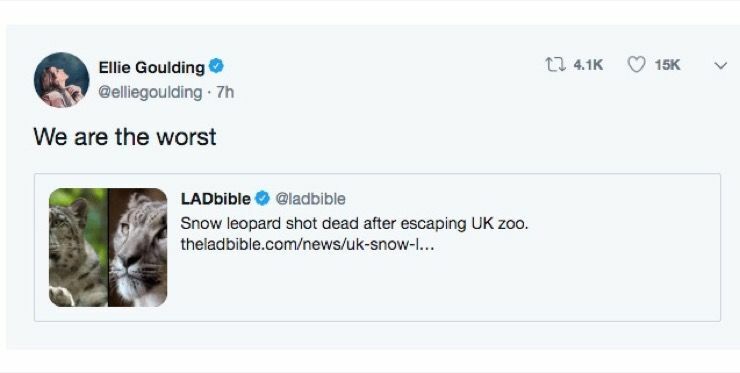 Before long, the stark white leopard was spotted wandering around the zoo. Animal escape procedures were soon initiated and keepers were given firearms to protect themselves and others. The safety of themselves and the public was at risk, they only had one option. Eventually, a senior member of the firearms team was able to get a clear shot on Margaash and regrettably had to take her down. He managed to kill her with a single shot so that she wouldn’t suffer. 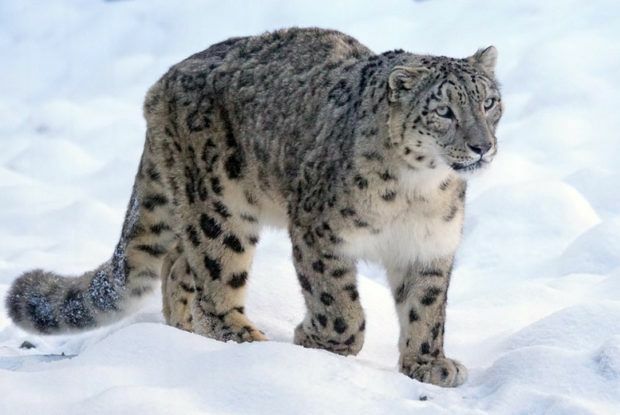 The loss is great, however, as even though snow leopards are only marked “vulnerable” on the endangered species list, their numbers are limited and still dwindling.